Finally, a gutter guard that is not SCREWED…down with 1000s of bolts and glue! 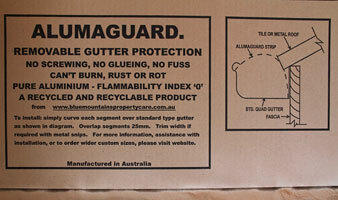 ALUMAGUARD is the world’s only removable, segmented ALUMINIUM gutter guard system. Why? It was developed in 2004 by Andrew Vilder, a resident of the Blue Mountains, NSW. Andrew is weary of being called out to unblock and/or remove expensive, over-engineered and often just plain stupid types of gutter 'protection' systems that fail disastrously in the long run, resulting in flooded gutters and ceilings. The gutter guard industry is completely unregulated by building codes or legislation in Australia. A bewildering array of devices are being marketed, usually by franchise holders who have no direct industry experience or relevant qualifications. It is my experience that gutter protection systems will fill up with fine sediment and plant seeds every 3 to 5 years, and this material must be removed or the gutter will cease transport water. Also, material will sit atop the guard. Just like your car, gutter guard must be regularly SERVICED! So many products out there are permanently bolted, rivetted and glued down, making such servicing either impossible or very difficult and expensive. I call this the ‘fortress mentality’. Each 75cm long piece can be removed BY HAND in seconds, to remove accumulated sediment WITHOUT USING PRECIOUS WATER.. It allows you to easily sandbag downpipes if a bushfire is imminent, and can even be taken with you to a different building if you move home! It is custom cut to any width, so can be placed into wide box gutters. Alumaguard can be fitted to roof valley irons in the fashion of a train tunnel, with segments overlapping each other from top to bottom. The CSIRO has tested this product as per AS 1530.2 to give a Flammability Index of ‘0’ for plain aluminium, and ‘1’ for anodized colours. Categorically, this product will not combust in a bushfire! In fact, aluminium melts in a furnace at 660 deg.C , so if gutter guard ever reaches this temperature, your home will have vaporized long ago! What could be easier or more flexible? Now here is the best part - the low price! For standard quad gutters, $27.50 per metre installed by us, or DIY supply only 200mm wide material $17.50 per metre. 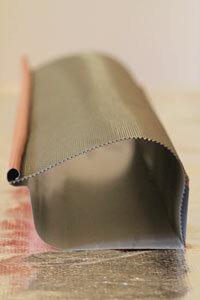 For deep fascia gutters, $33 per metre installed, or DIY supply only 300mm wide material $22 per metre. Fitted to Valley irons from $30 per metre. Box gutters and other custom sizes POA. Shipping of product available via Australia Post to anywhere in Australia, please contact us for a quote on postage and handling costs. Product displays at Joyce Roofing, Lawson and Skinners Hardware, Lawson.